Reacting to a combination aimed at overwhelming him, Napoleon Bonaparte deploys a new fighting formation that eminently proves its worth. During the summer of 1802, Europe was at peace for the first time in 13 years. The Treaty of Amiens (March 27, 1802), had ended what would later be seen as the opening round of the Napoleonic Wars. The peace, however, was to be short lived. By the spring of 1803, England once again declared war on France and resumed her blockade of the French coast. In response, Napoleon assembled an invasion army on the Channel coast, at Boulogne. The encampment at Boulogne provided France the opportunity to train her citizen army en mass. Before Boulogne, French troops were trained on the march or in regimental depots and then inserted into units in the field. Under this system troops received individual training in drill and company level tactics. At the “Camp of Boulogne” soldiers were given intense “refresher” training in drill and company tactics, but more importantly, they also took part in bi-weekly and tri-weekly battalion- and division-level exercises as well as a Corps level exercise on Sundays. Corps exercises stressed combined arms tactics, bringing for the first time infantry, cavalry and artillery onto the battlefield to learn to fight as a flexible but cohesive unit. It was this cohesion and flexibility that Napoleon was to use to its utmost advantage in the years ahead. While the Grand Armée trained for the invasion of England, the Russians and English were themselves hard at work rebuilding a coalition to keep Napoleon occupied on the continent. Czar Alexander I of Russia, perceiving Napoleon as a threat to Russian power in Europe, approached Britain and Austria in hope of reviving the anti-French coalition that had collapsed in 1801. At first the Austrians, who had already lost substantial territory and prestige in earlier efforts against Napoleon, balked at the idea of renewing the war. But finally bowing to Russian pressure, Austria signed a treaty with Russia on November 4, 1804. Alexander also approached King George of England and Gustavus III of Sweden, forming the Third Coalition. The allies planned to take advantage of Napoleon’s preoccupation with England and move against France while the bulk of its army was encamped on the Channel coast. 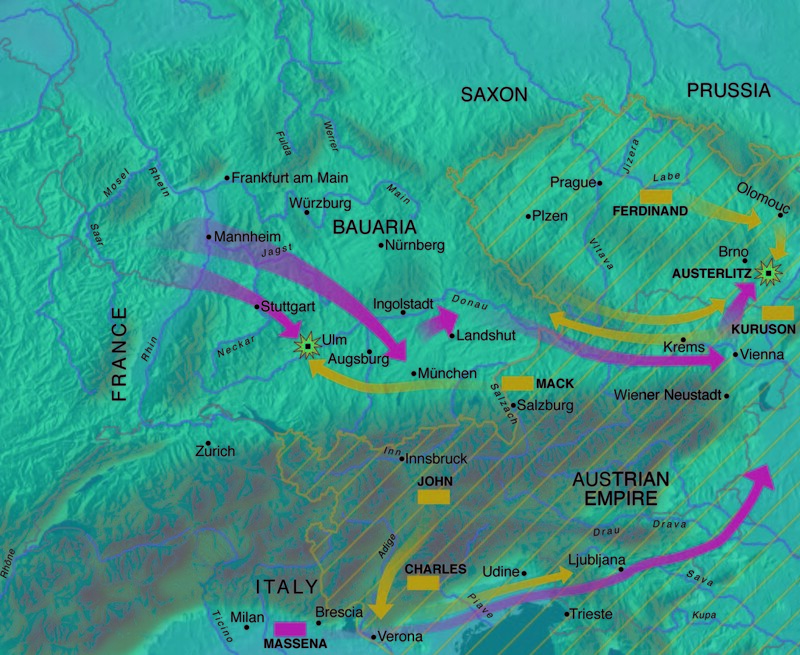 The first phase called for the 95,000 Austrians under Archduke Charles to make the main effort against Northern Italy, while the 70,000 Austrians, nominally under the command of Archduke Ferdinand but really under General Mack, advanced into Bavaria. This forced Bavaria to join the Allies while simultaneously moving into a position to threaten Napoleon’s line of communications when he moved against the expected target, Archduke Charles. As these forces were moved into place two Russian armies, 35,000 troops under Marshal Kutusov and 40,000 troops under General Buxhowden, were to advance through Bohemia to reinforce Mack in Bavaria. This combined Austrian and Russian force would then push forward through the Black Forest and Swabia toward Strasbourg, trapping Napoleon’s army in Southern France. The Allied plan had many flaws, which Napoleon would exploit to the fullest. First, the Austrians assumed that the main theater of operations was to be in Northern Italy and concentrated the bulk of their strength there. This assumption was based on their previous experiences against Napoleon in 1796 and 1800. They may have been correct if, as in the case of the campaigns of 1796 and 1800, the bulk of the French Army was located in central and southern France, not some 400 miles away in northern France as at present they were. Second, the Allies assumed they could concentrate their forces before Napoleon could react in strength. To achieve this concentration the Allies needed to coordinate the movement of four armies over both eastern and western Austria while maintaining sufficient operational security to hide their intentions from the French. Given the distances and the movement of forces over boundaries either neutral to their cause or sympathetic to the French, this effort would have been doomed to failure, even if the Allies had overcome the oversight by the Austrian command staff, called the Aulic Council, to account for the 10-day difference between the Russian Julian and the Austrian Gregorian calendars. Thus when Czar Alexander promised Austria that Marshal Kutusov’s army would reach Bavaria by October 20, they would in fact not be there until November 1, meaning that if the Austrians moved forward into Bavaria as planned they would not receive reinforcements for over a week. Third, the Allies assumed that they could achieve a unity of command sufficient to marshal their combined strength and overwhelm the French. This too seems unlikely given that Marshal Kutusov was ordered by the Czar to follow orders from the Austrian Emperor or the Archdukes, but not any other Austrian General. This command structure was further compounded by the unique arrangement between Archduke Ferdinand and his Quarter-Master General Mack. This arrangement, combined with Allied difficulties with security and coordination, would allow Napoleon to seize the initiative and dictate the course of the campaign. With victory, Napoleon was master of the Continent for years. Napoleon seized the initiative by exploiting the speed and flexibility of the Corps d’Arms system and the Bataillon Carré. These two innovations combined with Napoleon’s organizational and intellectual abilities gave the French with an advantage the Allies would not overcome for seven years. The average corps consisted of three infantry divisions, a light cavalry division, three heavy 12-pound artillery batteries and two medium six- or eight-pound batteries. Each infantry division was composed of three infantry brigades of two infantry regiments each, a six- or eight-pound foot artillery battery and a six- or eight-pound horse artillery battery. The light cavalry division comprised two cavalry brigades each of two cavalry regiments of either hussars, lancers or chaussers. The Corps d’Arms gave its commander, a General or Marshal, many advantages over the armies of the Ancien Régime, which used the tactics and structure of the 18th century. Armies had advanced into battle with artillery, cavalry and infantry in one form or another since the days of Alexander the Great. In Napoleon’s time this was still true; Mack’s army of 70,000 contained substantial numbers of all three of these arms. The difference between Napoleon’s system and that of the Ancien Régime lay in the subordination of these assets. When a Napoleonic corps was engaged in battle its commander could call on heavy artillery and cavalry support without having to contact a higher echelon. An Austrian or Russian wing commander in battle would have to appeal to a higher echelon for such support, costing him time and often the battle. The Corps d’Arms became an even deadlier weapon when employed in the Bataillon Carré. The Bataillon Carré, or “armed square,” was a march formation in which several Corps d’Arms would move in a square or diamond formation with Napoleon at the center. Ideally a Corps would be no more than one day’s march from the two nearest Corps and the front and rear Corps no more than 2 or 3 days march apart. Security and intelligence for the formation would be supplied by a cavalry screen preceding the corps. The screen would consist of units from the light cavalry divisions subordinate to each Corps. This formation provided Napoleon with the flexibility and speed necessary to achieve his strategic goal, the annihilation of the opposing force. The formation’s diamond shape made it possible for Napoleon to shift the armies’ strategic direction by simply moving the cavalry screen to face the desired point, redesignating the nearest corps as the advance guard and its reciprocal as the rear guard. This proved to be a much more effective formation than that of the Ancien Régime. An Ancien Régime army could never achieve this goal. The armies of the Ancien Régime marched on one road or closely grouped roads roughly in the order of cavalry, infantry, artillery and logistics. If they wished to change direction, the formation would have to take the time to realign or move in a wide arc as if it were on rails to face the approaching enemy. If it attempted to move as the Bataillon Carré did it would be in danger of engaging the enemy with only one arm of its force, placing it at a distinct disadvantage. Because the Bataillon Carré consisted of Corps d’Arms equipped with all arms, the formation could never be fully disrupted on the march. The use of separate and widely spaced roads, combined with the French strategy of “living off the land,” gave the French a decided speed advantage. By freeing themselves of a logistics train, the French were able to move far faster than the Allies. But this arrangement was dependent on the availability of supplies in the army’s path. Serious problems arose when the Grand Armée moved into Poland, Spain and Russia, where food was not as plentiful or the populace not so willing to surrender it. Both the Corps d’Arms and the Bataillon Carré would not have been as successful without Napoleon’s organizational and intellectual abilities to guide them. Napoleon and his Chief of Staff, Marshal Berthier, were able to maintain control of an army of several hundred thousand men spread over vast distances through intense preparation and Napoleon’s legendary memory. Each night Napoleon would dictate to Berthier’s staff the orders for each corps. Berthier and his staff would then turn Napoleon’s instructions into workable detailed orders to be distributed later that evening. This system proved to be highly effective, as was shown by the Grand Armée’s movement in the 1805 campaign and those to follow. But within its brilliance lay the seed of its demise. Over the years, as Napoleon’s health waned, the system would break down. The Napoleon of Austerlitz in 1805 was not the same Napoleon of Waterloo in 1815. Unfortunately or fortunately, depending on your perspective, it was the Napoleon of 1805 at the height of his abilities who ordered the Grand Armée to march from the Camp of Boulogne to meet the Allies in central Germany. That order was issued on August 28, 1805. By September 26 the army had reached the Rhine, and 17 days later 210,000 men (seven corps) had moved from the Rhine to the Danube, cutting off the army of General Mack at Ulm and forcing his surrender on October 17. As Napoleon’s victory at Ulm demonstrated, the speed and flexibility of the Corp d’Arms and Bataillon Carré allowed him, as was said by an unknown French soldier, to “discover a new way of waging war; with their legs instead of the bayonet.” The movement of the Grand Armée from Ulm to Austerlitz then demonstrated Napoleon’s movement to battle or Grand Tactics. The primary objective of every Napoleonic campaign was not territory or an enemy’s capital city, but the destruction of its army. To accomplish this task Napoleon relied on three variations of offensive maneuver, the maneuver in the rear, the central position and the flank attack. The maneuver in the rear, “la manoeuvre sur les derrier,” involved both an enveloping manuever and a flank attack. The advance guard would pin the enemy force while the flank corps, using either terrain or light cavalry as a screen, would move around the enemy and take up a position across his line of communications. The opposing army would then be forced to disengage and attempt to clear its line of communications against a prepared foe on ground of their own choosing. The manoeuver sur les derrier was designed to take full advantage of the Bataillon Carré and worked best when Napoleon either outnumbered or had a roughly equal number of troops as his opponent. If he was himself outnumbered he could maintain the initiative by seizing the central position. The central position was an offensive or defensive maneuver in which Napoleon would place his advance guard and cavalry reserve between two strong opposing forces. Once in position they would prevent the enemy from concentrating its force. By operating on interior lines Napoleon would then shift his corps to engage each force in turn. This would allow him to negate the enemy’s numerical advantage and give his force local superiority of numbers. The flank attack also involved the pinning of the enemy force by the advance guard and the cavalry reserve. Once the enemy was engaged, the remaining French corps would take up a position along the flanks, forcing the enemy to engage its reserves to meet this new challenge. Once the enemy’s reserve was committed, Napoleon would use massed artillery batteries to create a breach in the enemy’s line. The French reserve would then attack this breach and the enemy would be routed. All three maneuvers demonstrate the advantages of the Corps d’Arms in engaging a larger foe, and of the Bataillon Carré in allowing Napoleon to quickly concentrate his own forces at the chosen point. But all three maneuvers were dependent on Napoleon’s ability to maneuver his corps to bring the enemy to battle, a maneuver that eluded him from October 17 to November 27. 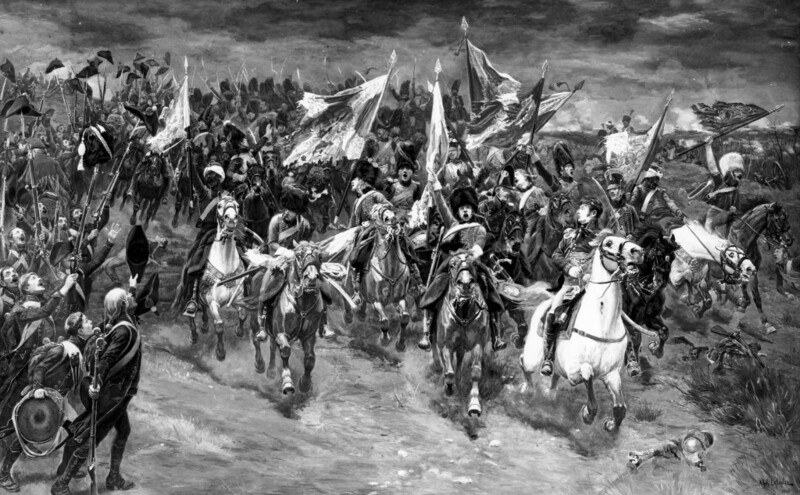 A spirited charge of Imperial Guard Cavalry at Austerlitz. It included Mamelukes, first raised in 1803. Napoleon’s victory at Ulm completed the first task of his campaign and gave him the initiative. To complete his victory he needed to bring the remaining Austrian forces and their Russian allies to battle before his own forces were depleted by attrition and exhaustion. To do so he ordered the bulk of his army to march on Vienna in the hope that the Allies would fight to protect Vienna before Russian reinforcements and Archduke Charles’s army in Northern Italy could enter the area. After placing Ney’s, Marmont’s and Augereau’s corps in Tyrolia to the south to guard against the advance of Charles and detaching several divisions to garrison points to the north to guard his flanks, Napoleon ordered the remainder of his forces across the Isar river at Landshut, Friesing and Munich in an attempt to engage the Russians south of the Danube. Kutosov, however, had no intention of defending his ally’s capital; instead, he moved his forces north of the Danube toward Krems, destroying as many of the Danube bridges in his wake as possible in an attempt to draw Napoleon toward him and open the French flank to Charles to the south. The capture of the bridge at Vienna, however, was quickly tempered by the news that Russians and Austrians had stopped the advance of a small French force under Marshal Mortier north of the Danube at Durrenstein. The battle, though small and eventually unimportant, did serve to remind Napoleon that time was not on his side; the Allies would soon receive reinforcements from Russia to the east and the Army of Charles was still approaching from the south. In response to the Russian check on his forces at Durrenstein, Napoleon ordered his army across the Danube in an effort to trap the Russians. The trap failed because the Russian were able to pull a ruse of their own by convincing the pursuing Marshal Murat that an armistice was being negotiated and all hostilities had stopped. Napoleon quickly sent word to Murat that he had been deceived and he should advance immediately, but the Russians had already escaped and were concentrating around the town of Olomutz, approximately 9 miles northeast of Austerlitz. The failure of Durrenstein allowed the armies of Kutusov and Buxhowden to, meet and together with remnants of the Austrian army they now numbered over 90,000, while Napoleon’s strength through attrition and detachments stood at 75,000. Napoleon no longer possessed the strength to achieve an enveloping maneuver and if he attempted to advance to engage the Allies at Olomutz he risked a costly frontal assault and dangerous extension of his line of communications. The solution then was to deceive the Allies into attacking him on ground of Napoleon’s choosing. Napoleon thus ordered Marshals Soult and Lannes to move toward the Allies at Olomutz and take up positions on the Pratzen Heights to the west of the town of Austerlitz. Napoleon hoped that the almost 89,000 Allied troops would see the unsupported corps of Lannes and Soult, 53,000 troops, as an inviting target and move to attack them. To entice them further Napoleon sent messengers to the Allied camp to negotiate an armistice, during which he gave every impression that the Grand Armée was a spent force and vulnerable to attack. By November 27 the Allies took the bait and began shifting forces toward Austerlitz. As they moved into place, Napoleon played his final card by ordering Soult and Lannes to complete the deception and give the Allies the dominating position of the Pratzen Heights, exposing his line of communication through Vienna to an Allied flank attack. The trap was set. On the evening of December 1, 1805, Napoleon issued orders for the following day in his Dispositions Generales. These orders reflected Napoleon’s belief in the strengths of the Corps d’Arms, the Bataillon Carré and French Revolutionary tactics. The French left was formed by Lannes’ V Corps anchored on the Santon Hills. The center was formed around the Zuran Hills where Bernadotte’s I Corps and the Reserve Artillery, the Grand Battery, would be placed with Oudinot’s Grenadiers and the Guard Division behind them in reserve. Murat’s Cavalry Corps would occupy the position between the Zuran Hills and Soult’s position, around the town of Puntowitz. Soult’s IV Corps would form the right side of the line, with Friant’s division at the end of the line the only unit between the Allies and Vienna. Davout’s III Corps, still a day’s march away at Raigon, was to march through the night and by morning take up positions at the end of the French line behind the Goldbach stream near the town of Telnitz. The Allies’ position was the reverse of Napoleon’s. The bulk of Allied strength was stationed on the Pratzen Heights, with only a token force stationed to the north opposite Lannes’ V Corps at the Santon Hills. From their position on the Pratzen Heights the Allies could threaten Napoleon’s right and by seizing the town of Telnitz cut his line of communications to Vienna, which happens to be what Napoleon wanted them to do. Napoleon’s plan for the battle was first to remain on the defensive to entice the Allies to attack his weak right flank toward Telnitz, while a division of Lannes’ V Corps would move forward to make contact with the Allied force opposite his position. Once the Allies had been committed to the attack in the south, they would be forced to commit their reserves, on the Pratzen Heights, in hope of gaining an overwhelming victory. This commitment of reserves would weaken the Allies’ center on the Pratzen. Once Napoleon thought the center had been sufficiently weakened he would order Berandotte’s I Corps reinforced by two divisions of Soult’s IV Corps and Murat’s Cavalry Corps out of cover behind the Zuran Hills and into the gap in the Allied line toward the Pratzen, cutting the Allies in two. The close-quarters fighting at Austerlitz was fierce, but Napoleon’s conduct of the battle gave the advantage to the French. Napoleon’s plan was designed to take full advantage the Corps d’Arms and French Revolutionary tactics. The Corps d’Arms combined-arms structure allowed Napoleon to concentrate the bulk of his forces for the “masse de decision” in the center. Both Soult’s Corps on the right and Lannes’ Corps on the left were expected to hold against a numerically superior foe. Soult’s Corps was to face the bulk of the Allied army through the opening phase of the battle until Davout’s Corps could be moved into position behind their line. The “masse de decision” or “masse de rupture” was used to create a breach in the enemy line where, as Napoleon once said “the breach once made, the equilibrium is broken and everything else is useless,” meaning the enemy commander has lost all options. The breach would be created by massed artillery, a Grand Battery, firing on the chosen point followed by infantry divisions attacking in column formation to break through the line. The former was an innovation of Napoleon’s; the latter was a legacy of the French Revolutionary Armies. To maximize the artillery’s effect Napoleon would group it into a Grand Battery. Using guns from his army reserve and in some cases from nearby corps, Napoleon would place the Grand Battery on a dominating position along his line. The battery would then be used against a single target, a regiment or battalion to create the necessary breach. This tactic differed from the Allies’ in that their artillery would be spread across the field in smaller concentrations, usually in support of infantry formations or to hold a gap in the line. Once a breach had been made, infantry columns would assault to widen the gap. The use of infantry columns to engage enemy formations was an innovation of the French Revolutionary armies. Traditionally infantry would march to the battlefield in column and then deploy into line to engage the enemy. A battalion in line consisted of eight to 10 companies in three ranks, two for the British, which when deployed could bring approximately 600 muskets to bear on the enemy across a frontage of 200 yards. This formation maximized the firepower of infantry at the price of speed and maneuverability. After the levee en masse in 1793, the French Revolutionary armies lacked the training and discipline necessary to engage effectively in line. 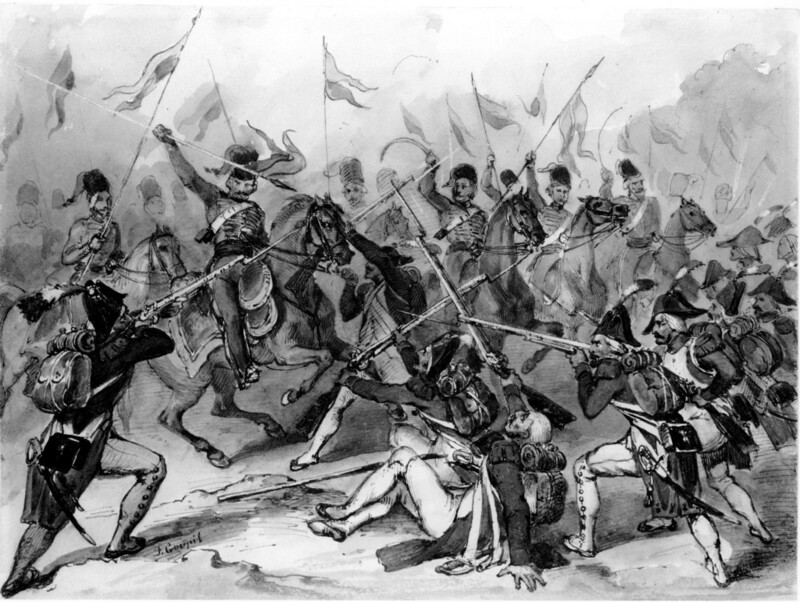 To compensate they would attack in columns preceded by large numbers of skirmishers. A column consisted of eight to ten companies one behind the other or as a column of divisions with two companies placed two abreast and four companies deep each on a front of approximately 50 yards. The skirmishers would disrupt the opposing line formation and screen the approaching columns. Once the columns had closed to within 100 yards, the effective range of a musket, they would charge the opposing line, breaking its cohesion and integrity. As the Revolutionary armies gained experience and training they adopted the formation of le ordre mixte, which involved the “mixing” of line and column formations in which a battalion in line was supported on each wing by an infantry battalion column. The speed and maneuverability of both the l’ordre mixte and the traditional column gave a distinct advantage to the French over their continental opponents for most of the Napoleonic wars, until the Allies began to adopt the tactic of employing their own skirmishers to chase off their French counterparts, thus exposing the columns to artillery and infantry fire, to which they were vulnerable. By 9:30 the French were in possession of the heights and the battle was all but won. With the center of the Allied line now in French hands, Napoleon turned his attention to the flanks. To the north, Lannes’ Corps with the help of Murat’s Cavalry Corps had survived an attack by the Russian Imperial Guard and by noon had succeeded in severing that part of the Allied line from the main Allied army. In the south the picture was very different; Davout’s III Corps still faced the bulk of the Allied army, 35,000 troops, which were still attempting to turn Napoleon’s right flank. Reacting to Davout’s plight Napoleon began to shift forces to assist the III Corps. By 1:00, Vandamme’s Division had moved into place to the northwest of the Russian position in an attempt to turn the Russians’ right flank. After fierce Russian counterattacks he was able to take the town of Aujest Markt on the Russian right, and Davout’s divisions had gone onto the offensive. By 3:00,the Russian position in the south had been broken and the battle was over. Napoleon’s victory at Austerlitz marked the end of the demise of the armies of the Ancien Régime, begun by the French Revolutionary Armies. For the next seven years the Grand Armée and Napoleon’s art of war would be practically unbeatable. It would take the vast Russian plains in 1812 to accomplish what no army had succeeded in doing to that point: the destruction of the Grand Armée. The campaigns of 1813 and 1814 attest to the value of the Napoleonic system, because by then the armies of Austria and Prussia had adopted the system to their own use. By 1832 and 1838, two of Napoleon’s contemporaries Carl von Clausewitz and Antoine Jomini proposed theories of war based on Bonapart’s methods. From their writings, the Napoleonic principles of concentration, mass, unity of command, and speed formed the basis for Western military doctrine well into the 20th century, laying credence to the claim that Napoleon is the Father of Modern Warfare. Tags Alexander I, Aulic Council, Austria, Bataillon Carré, Battle of Austerlitz, Britain, Camp of Boulogne, Corps d’Arms, France, Germany, Grand Armée, Marshal Joachim Murat, Marshal Louis Berthier, Mikhail Larionovich Golenishchev-Kutusov, Napoleon Bonaparte, Napoleonic Wars, Pratzen Heights, Rhine River, Russia, Sweden, Third Coalition.